"It is time to come together across our differences to care for each other and our common home." UNLESS by Stephanie Cardon is a vibrant floor-to-ceiling installation that fills the main entryway of Boston’s landmark Prudential Center. Commissioned by Boston Properties and curated and produced by Now + There, UNLESS explores sustainability, climate justice, and how taking action together can create positive change. Through the use of bright colors, bold contrast, and strong shapes, UNLESS creates a striking visual interruption and moments of curiosity in a bustling marketplace. The artwork is on view at the Prudential Center, Boylston Entrance located at 800 Boylston St, Boston, until December 28, 2018. Listen to specially recorded audio segments from climate justice researcher Dr. Julian Agyeman, sustainability expert Eric Van Vlandren, and Mia Mansfield the City of Boston's Climate Ready Boston Program Manager discussing the ways waste and climate change are affecting Boston and what we can do to create a more sustainable and just way of living. Wonderland “Public Art In Prudential Center Atrium Is A Call To Halt Global Warming,” September 30. WBUR “10 Public Art Installations To See In Greater Boston This Fall,” September 27. DigBoston “UNLESS: Massive Piece of Art Tells Simple Message About Global Warming,” November 8. NECN “UNLESS Urges Action on Climate Change,” November 21. UNLESS encases the glass walls and the center staircase of the main Prudential Center entryway, immersing the 80,000 individuals who pass through daily in a shared experience. Across the windows hangs a 3,400-square-foot contemporary tapestry made of repurposed neon orange and brilliant blue construction debris netting that incorporates embroidered text from Pope Francis’ Encyclical letter, Laudato Si’: On Care for Our Common Home, a 2015 call urging swift and unified global action towards climate justice. The symbolic blue circle featured on the tapestry is repeated on the floor and staircase, juxtaposing the warm, welcoming glow, with a critical call to action — if everyone on the planet were to consume at the current US rate of consumption, the global population would require four earths to sustain itself. It’s time to think about the earth as a whole, as a common. Cardon put the sustainable and equitable practices espoused in On Care for Our Common Home — caring for the environment and those who are most at risk — into action throughout the six-month creation of UNLESS. 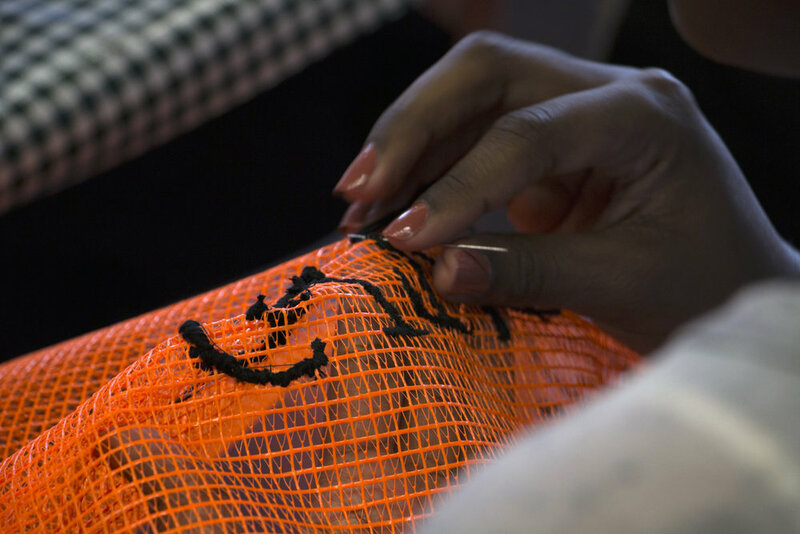 30% of the netting used is upcycled directly from Boston-area construction sites and to build the piece, 30 makers — members of the Inquilinos Boricuas en Acción community at the Villa Victoria Center for the Arts in Boston’s South End, as well as Mass Art students from Puerto Rico, displaced by 2017’s devastating hurricanes — worked alongside the artist and were paid fair wages to sew and repair the used netting. UNLESS is a response to the challenges we face because of climate change and the action we can take to engage with more environmentally conscious approaches to our day-to-day urban lives. Hear from artist Stephanie Cardon about her motivations for creating UNLESS and the thoughtful and collaborative creative process that brought this work to fruition. Cardon’s work has been exhibited nationally and internationally at such places as deCordova Sculpture Park and Museum, VSOP, and The Center for Maine Contemporary Art.She has been an artist-in-residence at The Wassaic Project, Ucross Foundation, AIRIE (Artist in Residence in the Everglades).. Cardon holds a BA in History and Modern Languages from the University of Oxford, a graduate certificate in Photography from ICP, and an MFA from Massachusetts College of Art and Design. Since 2016, she has been an Assistant Professor in Studio Foundation at Massachusetts College of Art and Design. Climate change knows no borders or nationalities but its effect will exacerbate the divisions we have drawn between peoples, fomenting xenophobia and racism. This is the time to come together across our differences to care for each other and to organize in defense of our common home. UNLESS was installed between 7pm September 18, 2018 and 10am September 19, 2018. Amazing transformations can happen over night. Completion of the installation was commemorated by Boston Mayor, Martin J. Walsh, The City of Boston, and the Mayor’s Office for Arts & Culture with the proclamation of “Common Home Day”. Arts Commissioner Kara Elliott-Ortega was on site to read the proclamation and recognize the work of the many who made UNLESS possible.